Unlike the ancient Greeks, today's mythmakers tell stories and build legacies using a variety of media. Students finished reading Homer’s The Odyssey and explored concepts like nobility, mythology, the power of words and legacy. They were then tasked with creating their own modern myths and the results were wide-ranging. 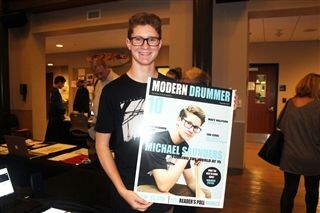 A rock star drummer, a clothing designer, a confections magazine editor, these were just a few of the modern myths the ninth graders chose to explore as part of the MUSE project. One student used virtual reality to create an entire universe, another student told her story through tap dancing. The students presented their projects to the community during the MUSEum on January 10.